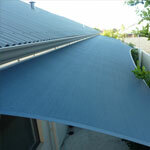 Aussie Coolshade Sails are manufactured from the best quality, proven shade cloth products making them suitable for residential and commercial applications. We use Extra Heavy Duty Knitted waterproof shade sail cloth that carry a 10 – year UV Warranty and provide maximum UV protection. Our shade sails stand out from the rest in that they maintain their shape and tension over the years. We follow Engineers Specifications that cover strength of fixing points, steel posts and footing sizes. 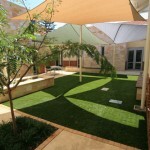 The key to a successful shade sail relies on its design in order to be effective and good looking. Our friendly consultants have extensive experience in the Shade Industry and can therefore assist you in designing a custom made shade sail to suit a variety of areas. Waterproof sails are manufactured from the same premier shadecloth with the added benefit of a clear polymer membrane. These sails still provide up to 97% shade as well as being waterproof. This is an area where we need all the protection from our harsh Australian sun. Our shade sails block up to 96.9% UVR providing maximum protection against strong ultraviolet rays. 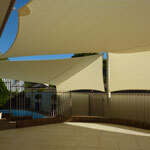 With our experience we can design a shade sail to produce a fantastic visual effect over your pool. Let us create the perfect environment for all your outdoor entertaining. 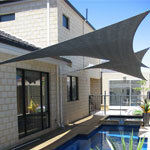 Our high quality, superior shade sails are an effective and stylish way to increase your outdoor living space. Retaining privacy from neighbours or adjoining double-story homes are becoming more difficult in our suburbs. 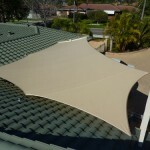 Our unique privacy sails are an ideal solution, providing instant privacy and shade. This type of shade sail provides absolute cover with no gaps to let sunlight through. Ideal for areas of your house that receive high exposure from the sun. Excellent protection for large windows and sliding doors. We have an extensive range of colours available for use. Click here to see our full range.